AURIX™ TC3xx sets a new standard in scalability and inter compatibility within the family. This enables system suppliers to offer platform ranging from cost effective to high perfor­mance solutions while minimizing R&D efforts and time to market. As a host controller in gateway and telematics applications, AURIX™ TC3xx microcon­trollers support the latest communications interfaces and feature a Gigabit Ethernet interface, up to 12 ISO 11898-1 compliant CAN FD channels and, up to 24 LIN channels. An additional eMMC interface for external flash interfacing enables local data storage supporting software-over-the-air update concepts. Realtek’s RTL9047AA is an automotive Ethernet switch controller with five integrated 100Base-T1 PHY transceivers, one fast Ethernet PHY and up to two full featured xMII inter­faces to provide access via an external CPU or to a cascade switch. The RTL9047AA switch is AEC grade 1 qualified. It is ideal for various automotive applications such as Advanced Driver Assistance Systems (ADAS), the gateway, or infotainment and telematics systems. The Automotive Gateway offers a huge range of Application use cases. With the AURIX™ TC397XX B Step in combination with Realtek’s RTL9047AA Switch future In Vehicle Networks can be addressed and evaluated. The TC397XX B Step is connected with a 1Gbps RGMII port to the switch for data transfer and one SPI channel for managing the Switch. RTL9047AA five 100Base-T1 Ports together with the MATEnet connector set provide the right feature set to connect the Automotive Gateway Board to an In Vehicle Network. 12 CAN-FD, 4 LIN and 4 Flexray channels allow bridging of different network topologies. AURIX™ TC3xx does not compromise on security. The second generation of the programmable Hardware Security Module (HSM) is available across the family for secure on-board communications and to prevent hardware manipulation such as tuning. Infineon’s Trusted Platform Module (TPM) SLB9670 is the latest product featuring a fully TCG TPM 2.0 standard compliant module connected via SPI to the AURIX™. AURIX™ TC3xx sets a new standard for scalability and intercompatibility in the family. It enables system suppliers to offer different platforms ranging from cost-effective to high-performance solutions while at the same time minimizing R&D effort and time-to-market. In gateway and telematics applications, AURIX™ TC3xx microcontrollers support the latest communication interfaces. They also feature a Gigabit Ethernet interface, up to 12 CAN FD channels compliant with ISO 11898-1 and up to 24 LIN channels. 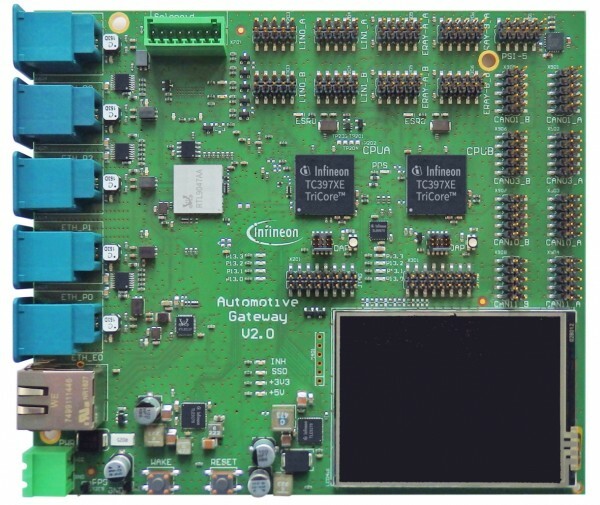 An additional eMMC interface for external flash interfacing enables local data to be stored, supporting software-over-the-air update concepts with the lowest power consumption levels.